Surrey Sam wrote: I've said it to a few people now that unless you want an ASBO exhaust, the Non Res is too much. Revolutions suggestion would seem about right, get the resonated centre section and you'll then go back to using the exhaust valve system the way it should be. Which is to open it up, rather than throttle back something that is too much. I can't comment on deleting the downpipe resonators but it's currently on my own radar. I quite like the idea of the JHM ones but Miltek is far cheaper, Supersprint also have some. Sport Cats would be an engine drop situation, as they're tucked up right into the exhaust manifold. So I think the advice there from Revolution was a bit off and they perhaps were thinking more for a B7 RS4 rather than B8. Sports cat is still legal right? 'Just'? De cat (complete) is not? That's what MRC website leads me to believe anyway. I've ordered the resonator and will be fitting in a week or so. Really appreciate you guys getting back to me on this. I guess it was a bit of common sense but good to gauge from people who have more knowledge. ASBO...hard to argue that in all honesty. Well. I'll be selling the Center silencer replacement piping on here soon haha. @no_idea called my bluff! Drove to Scottish highlands yesterday and just found myself backing off, trying not to go over 3500rpm. Which is just plain wrong. And the drone got worse the hotter it got too. Even in comfort. I just hope I can still have that low end rumble and excitement with fitting this Res part. With the centre resonator section fitted, I'm sure you can still have that low down grumble with valves open. It should just be quieter around town and less raucous at the top end. Surrey Sam wrote: With the centre resonator section fitted, I'm sure you can still have that low down grumble with valves open. It should just be quieter around town and less raucous at the top end. Yeah they're pretty high up. I was wondering why MRC were charging so much for that. Can't seem to find pricing on the sports cats. Any ideas? Milltek only showing the 3 full systems. Would they mate ok with your Akra? I feel I am now an expert for this thread haha. -You 'cannot' drive around day to day, going to get your milk or whatever with valves open. If you say you can, I suggest an appointment at your nearest medical centre. The boom. Oh, the boom is horrendous. -Crossover volume is very on/off from closed to open. On a long drive it can become quite tedious. However, Sam has an app for that. A module that keeps valves closed/open permanently. I think I might get that. -Want to have some fun? If you are in the moment, you want to give the funky business and manually shift etc, this exhaust turns the RS4 into a NASCAR. Haha. It's intoxicating. Be warned, however, it can get on your wick after a couple of hours if you're out on a drive with your mates etc all day or just out for a long time. -Obnoxious? Valves open or booting it in a built up area, yes. My conclusion after buying the Non Res and swapping to Resonated centre section, and then back to Non Res is as follows. Initially going from stock to Non Res, there is a real 'what have I just done' moment. But the low end theatre and just burbles and grumbles make this car such a joy. Just a dab of gas or even idling at lights. Special. Then going on a couple of long journeys, the exhaust noise in comfort with valves closed isn't drone. It's just exhaust noise. There's no vibration. 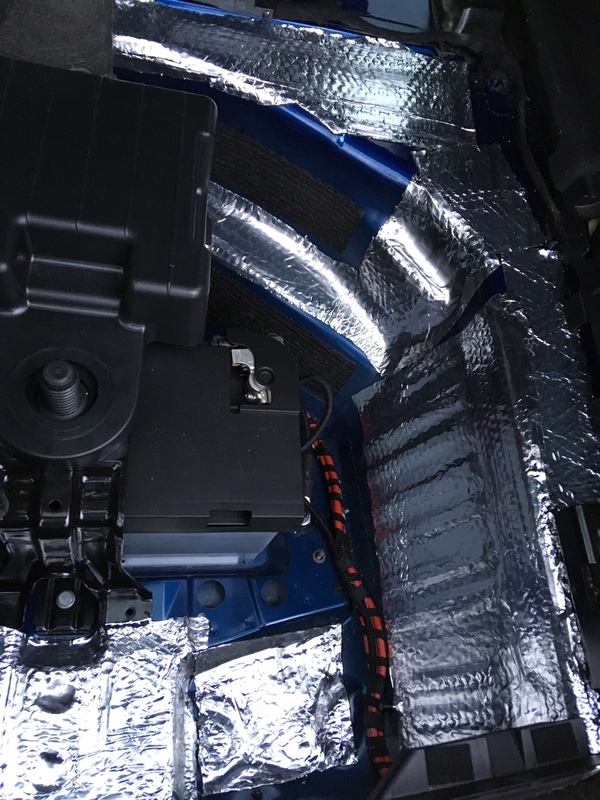 I applied some Noico sound deadening in the boot which did take a few minor annoyances away. But yeah, after say 3-5hrs, it's 'there'. Just saying. You will hear it. Not loud. Just there. The thing that made me want to go to a resonated centre section was about 5-6hrs into the journey, the roads opened up in Scotland and I switched to hooning it. After about 30 mins, the sheer volume just started to pee me off. Kinda felt like I just wanted to back off or not go over 3400rpm. Could it have been he long journeys there and back? Maybe. I got the centre muffler from Milltek fitted and ummmm...it died in my opinion. Lost that character. There's boom between 1700-2200rpm with valves open. I 'thought' valves open on the resonated system would be like valves closed on the Non Res system. But nope. Just isn't. So I got the Non Res section fitted again today and I bloody love it! At least it's honest haha. I'll just live with the volume. The valves are its saving grace. I kid you not. That's as honest as I can be but I've learned that sound, volume, resonance and drone truly are subjective guys. But unless you can first experience both systems first hand, you'll never get a real feel for in cabin sound from YouTube etc. Might be selling the resonated centre section. It's brand new! Less than 100 miles on it. Agree on the burbles and gargles from overrun. None of that fake fart malarkey on some cars... been there, done that! Res just dilutes it all. For a B8 I think Sam probably has the best option (Akra). For the Milltek, if the volume is too much, you could try adding some noise reducing material in the boot to dull it down a bit. Valves closed: Better sound and more volume than valves open on the OEM sports box, nice V8 but not too much. Valves open: OMFG! It's nae subtle... Great fun for a b road blast, it turns everything into a real theatrical affair! You can literally feel it in the car. Almost bearable in town if you drive around the 2000rpm boom, but it's too much for 90% of us I'd think! It's entertaining for 20min but it really is too much. No motorway driving yet, but at 70 you'll be sitting around the 2000rpm mark in 7th gear and that's going to be terrible with valves open. In summary, I love it!! But I'm very glad I can shut the valves in town/on the motorway! marc1 wrote: Agree on the burbles and gargles from overrun. None of that fake fart malarkey on some cars... been there, done that! I'm not getting notifications lately. Just seen this. Tut. Yeah you're bang on. The Akra is the most refined that still packs a punch. Already done it haha. It helped a bit actually. I tried the closed cell foam but I'm all honesty, it just numbed the sound and made it boom. I'm loving it now. Sam put it into perspective for me.